There have been several different versions of chairs with built-in speakers. Usually they have about the same shape and come in the very typical black. On occasion they toss in a little blue, but that’s about it. There are even a few very feminine bright pink versions. The great thing about this MUR-01 Music Chair is that it gives a slightly different color combination, that makes it look a little less like it could only be used in a college dorm. Although it still would blend right in with the college environment. The chair has a built-in 2.1 channel speaker system, with a woofer and amplifier located at the back of the chair. One down side of this chair is that it doesn’t have a battery pack of any kind, which means you’re stuck plugging the chair into the wall when you want to use the speakers. It just gives you one more cord to potentially trip over or cause someone else to trip over. 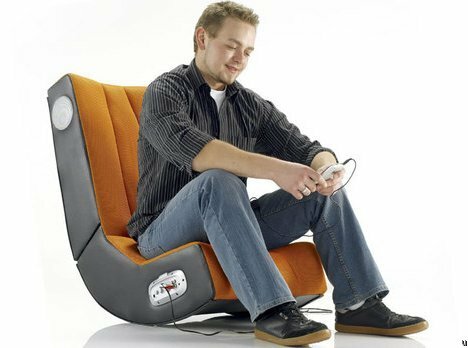 The chair also comes housed with RCA and stereo inputs to hook your music up to. It’ll be available in Japan in mid-July for 19800 Yen or about $200.